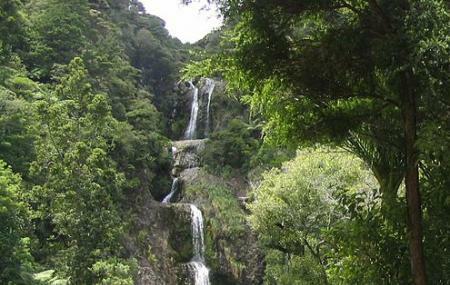 The Kitekite Falls are one of the most famous waterfalls in the Waitakere Ranges. Having six drops, the Kitekite Falls end up into a large lake at the bottom. The water is crystal clear and one can take a dip in the lake as well. The falls can be reached by finishing a small hike of about half an hour. The trail to the Kitekite Falls is a pleasant one. Amenities such as toilets, a picnic area and plenty of parking spaces are available at the start of the trail. The trail is pretty easy and climbs up gradually. Hence, it is wheelchair and pram accessible. Bus till Piha and then hiring a taxi till the entrance of the trail. How popular is Kitekite Falls? People normally club together Arataki Visitor Centre and Auckland Zoo while planning their visit to Kitekite Falls. Walk was great, wasn't too tiring and the waterfall was worth it! The track has reopened to the public on the 26th of Dec 2018, with new walkway covering to help combat the Kauri Die Back outbreak. Just keep to the walkways and the track will remain open. Nice entry level hike route. Even in hot summer mid day, you will feel cool to walk here. Once you reach the waterfall, would suggest to take extra hike to go up on top of the waterfall. Enjoy the water, view and small pool up there. Fresh water to enjoy in hot summer day.